Do you have an urge to try something new?! 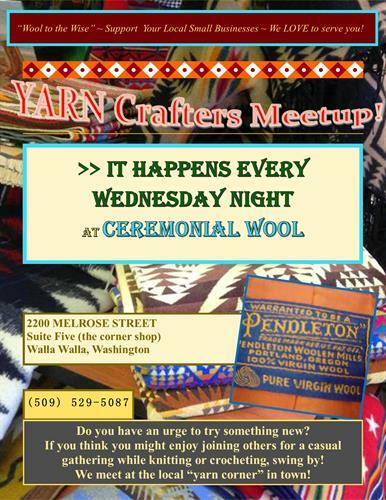 Well then, gather up your portable Fiber Arts project, whether knitting, crocheting, even spinning or tatting, and join other like-minded folks over at the local "corner" yarn shop, Gift & Yarn in Walla Walla. We meet every Wednesday and new faces are always welcome! Weekly Event! Always FREE, snacks and tea provided! Proceeds from sales support fair trade farmers.